I have a long term interest in atempting a GP40MC build. One element that I lack is sufficiently detailed photos of the underbody area, specifically between the rear of the fuel tank and the front of the rear truck on both sides. This is not the sort of "nice" photo that typically makes it onto photo posting sites. The ones that are there don't show the tank and piping details on the right side and the equipment details on the left side as clearly as I would like. I unfortunately lack the time to hang out at a commuter rail stop and wait for one to pass by and later return so I can get the other side. I also don't know of a way to predict which trains have GP40MC for power. The real-time app that I've been playing with reports train number or cab car number, but doesn't seem to care about locomotive number. 1. Can anyone suggest a location such as a layover yard where a GP40MC might be found for an extended period, and where it would be both safe and legal to get relatively close on both sides and take some photos of my own? I do have a decent camera with a pretty good telephoto lens. 2. Does anyone have (or have an easy way to get) pictures like that they would be willing to share? 3. Any other suggestions for me? Rockport might be a good place...a couple of the layover tracks are essentially in the parking lot. Bradford you can probably see the side of one of the four units that would lay up there on the weekend, but that's about it. Porter Square station may not be a bad place as it's a low center platform, although you wouldn't be able to photograph it stopped. A station like Framingham might be a place to hang for a bit since trains turn there during the rush giving time to cross over the pedestrian bridge. These may be of some help. I am going to suggest rockport as well, Bradford you can't get close and it hardly ever has 1100s there overnight. Usually since 108/131 has 7 cars, it will have either a rebuild or geep for power and it puts away on the back track which should allow you to get close shots. Some of the photos here may be of help. I have read that 1025-1036 were built by M-K and classed as F40PHM-2C. 1050-1075 were later built by EMD and classed as F40PH-2C. I have looked at available photos and cannot see any significant external difference that would distinguish one class from the other. Is there in fact no obvious external difference, or am I missing something? 1050-75 are the older group. IIRC it has been mentioned elsewhere on this board that there are some spotting differences between the two groups, but they are very subtle. Thanks for your correction MBTA3247. I thought that might be the case from the photos I have seen. If anyone out there knows what the differences (if any) are, I would still be interested. Most of the differences between the MK F40PHM-2Cs and the EMD F40PH-2Cs are all in the cabs of the locomotives. A few examples are: MK units have no windshield defroster while the EMD units do, MK units have a pushbar handle on the engine room door in the cab(similar to Metro-North's M2-M6 fleet) while the EMD units have the basic door handles, the frames around the side windows in the cabs on the two classes are also different but harder to explain. Oh that reminds me, there is a spotlight above the rear platform next to the rear headlight too. MK units have them while EMD units don't. Thanks to all for your information. I can't find any photos of the rear of one of the M-K units to see this light, but I suspect that I would just build an EMD model anyway. I have found few clear photos of the roof over the HEP generators, so that areas a bit of guesswork anyway. I did see some good comparison shots of the can side windows, and I don't see any differenced that are likely to be visible on an HO scale model. Thanks again. If anyone has photos I might find useful, feel free to contact me offline. I think there's some difference in the panels on the sides of the unit, but it is very subtle. I started working on one of these units once but gave it to a friend who may have finished it up by now. 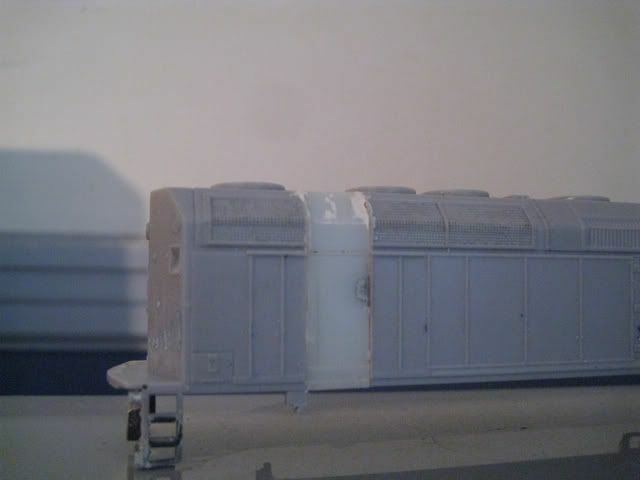 It's a fairly easy kitbash for the shell, where I spliced a section of F40 body between the 2nd and 3rd fans. The frame will have to be lengthened with some Brass stock, and I don't know how to do the universals, though I figured some SD40 driveshaft parts may have sufficed. I don't think any of the T units have dynamic break fans, so this will have to be plated over. IIRC the Walthers model is more correct for a T engine than the Kato. Just curious if anyone else plans on picking up the 010 and 011 in HO. True Line Trains has produced them and they should ship soon, if they have not already. I am going to get both, with sound. They will look great with my Walthers cars, although the colors on the Walthers cars are a little off.